IDRS in Granada is getting closer! Buy your 5 day ticket and enjoy more than 120 activities, including international competitions and more than 2000 m2 of trade stands where leading exhibitors will be present. There will be more than 100 performers offering concerts, masterclasses, workshops, and lectures. 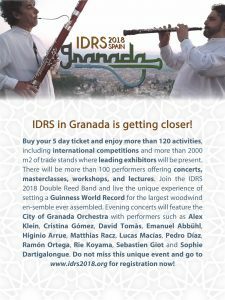 Join the IDRS 2018 Double Reed Band and live the unique experience of setting a Guinness World Record for the largest woodwind en-semble ever assembled. Evening concerts will feature the City of Granada Orchestra with performers such as Alex Klein, Cristina Gomez, David Tomas, Emanuel Abbi.ihl, Higinio Arrue, Matthias Racz, Lucas Macias, Pedro Diaz, Ramon Ortega, Rie Koyama, Sebastien Giot and Sophie Dartigalongue. Do not miss this unique event and go to www.idrs2018.org for registration now!